Though it’s not as powerful as the Exige 360 Cup, the Sport 350 is quicker from 0 to 60 due to the numerous weight-reducing and aero-enhancing solutions it employs. As its name suggests, this Exige is also part of Lotus’ recent revival of the "Sport" badge, which was first used on the Esprit in 1993. The name was discontinued six years later with the Esprit Sport 350, which makes this new Exige somewhat of a spriritual successor of the former. 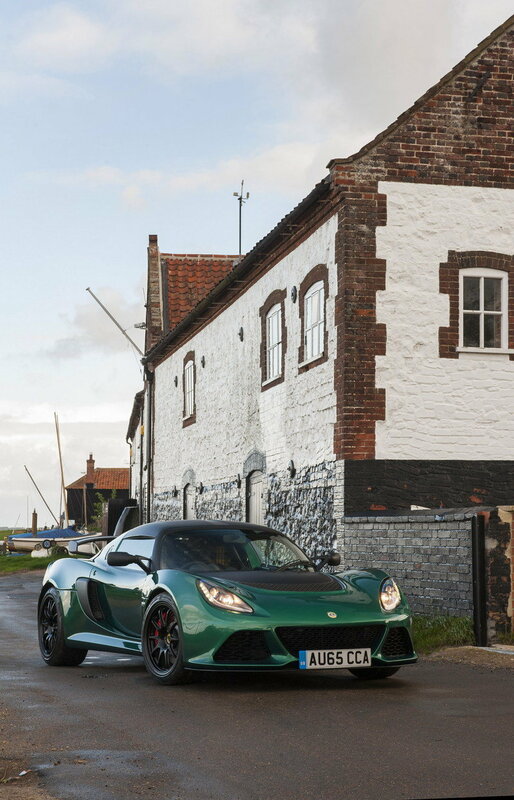 "With the Exige Sport 350 we took an already phenomenally quick car and made it even faster, more dynamic and more pure, perfectly demonstrating our Lotus design philosophy of ‘lighter and faster’," said Lotus CEO Jean-Marc Gales. Updated 12/17/2015: Lotus dropped a first promo video for its latest Exige Sport 350. 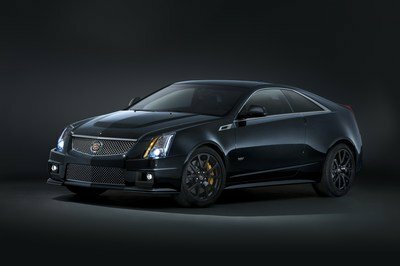 Hit play to watch the car in action and enjoy the sound of its V-6 engine. Not surprisingly, the Sport 350 is almost identical to the 360 Cup on the outside. 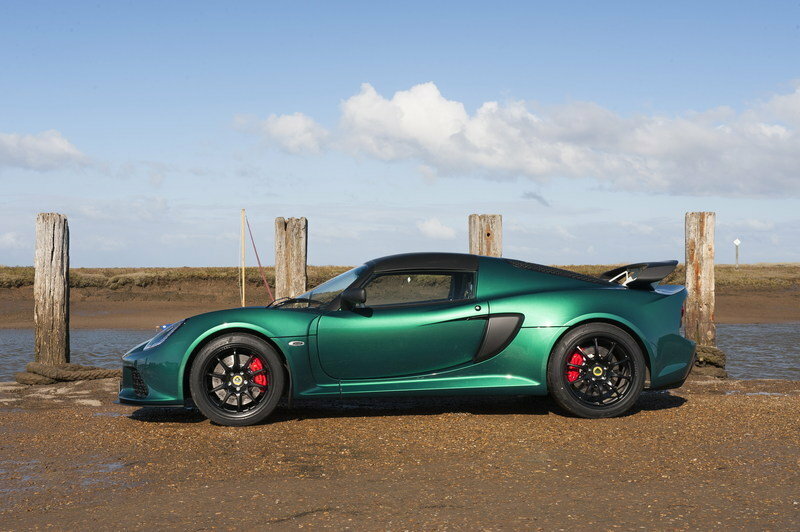 Lotus is known for keeping the design of its special edition models close to the standard car, and the Sport 350 is no exception from that rule. 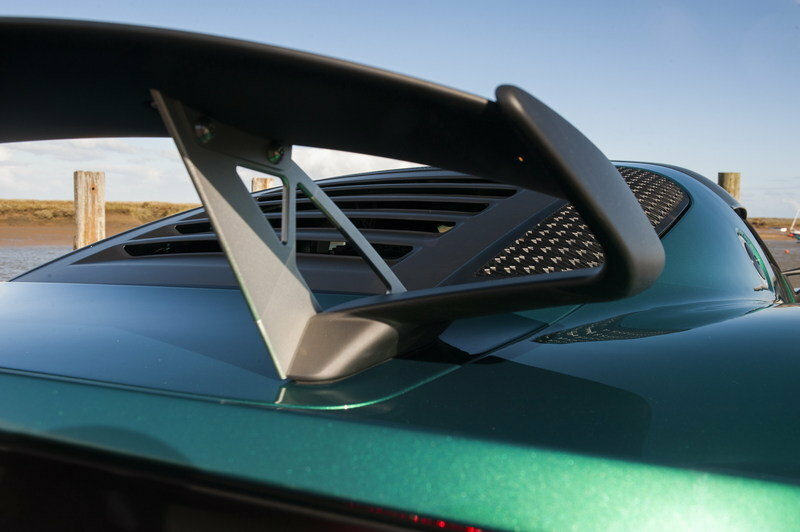 However, because it is based on the V6 Cup, it comes with all the goodies seen on the brand’s Exige-based track cars, including a comprehensive aerodynamic kit that consists of a front splitter, sporty side skirts, a rear wing, and a rear diffuser. Identical to the 369 Cup to the untrained eye, the Sport 350 does have a few features that set it apart. Identical to the 369 Cup to the untrained eye, the Sport 350 does have a few features that set it apart. For instance, the black lid that covers the front compartment gained a grille section toward the nose. On the sides, only the wheels are new, now sporting a multi-spoke design. The 360 Cup came with standard twin-five-spoke rollers. More changes are noticeable around back. The engine lid has a slightly different center section (but with identical louvers), while the small horizontal slats on the sides have been removed for a cleaner look. Below the rear fascia there’s a revised diffuser with smaller wings and a new twin-exhaust pipe. Another tiny detail is that there’s no "Exige" badge, while the "Sport 350" emblem was placed on the bumper. On the 360 Cup, it was located on the fascia, below the right side taillights. Just like the 360 Cup, the front splitter, rear wing, front access panel, roof panel, wing mirrors, and rear diffuser are finished in matte black. Optionally, they can be painted in body color at no cost, but I think black makes the Exige look a lot more aggressive, especially if combined with light or bright hues. 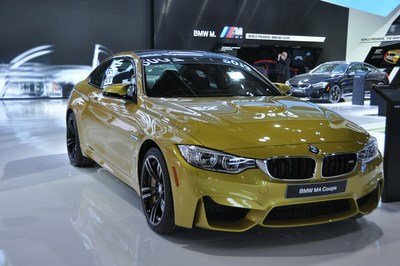 A bit of customization is possible thanks to the optional forged alloy wheels, which reduce the car’s curb weight by a further 5 kg (11 pounds), and either black or yellow brake calipers. All told, the Sport 350 isn’t that new as far as styling goes, but it’s still a cool sports car to look at. Just like the exterior, the interior is similar to the 360 Cup too. The Sport 350, however, benefits from larger switches, a new engine start button, and new trim packages that include a heritage theme with tartan upholstery for the seats and door panel inserts. 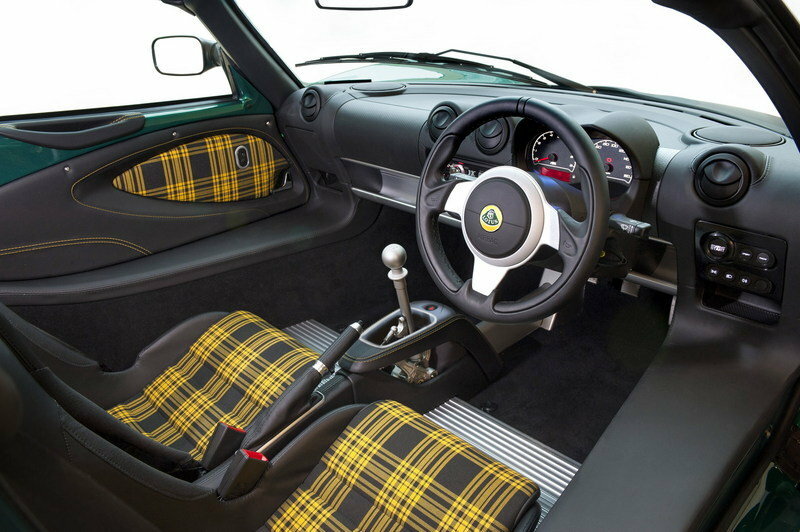 Revived on the Elise Sport 220 for the first time since it was introduced on the first-generation Esprit in 1976, tartan is a pattern consisting of criss-crossed horizontal and vertical lines in multiple colors, similar to the layout seen on Scottish kilts. 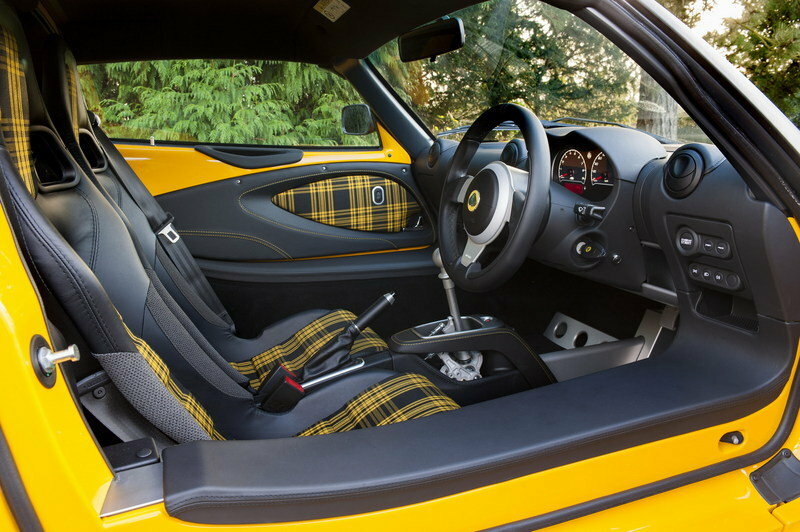 For the Exige, the tartan upholstery is available in either red or yellow. 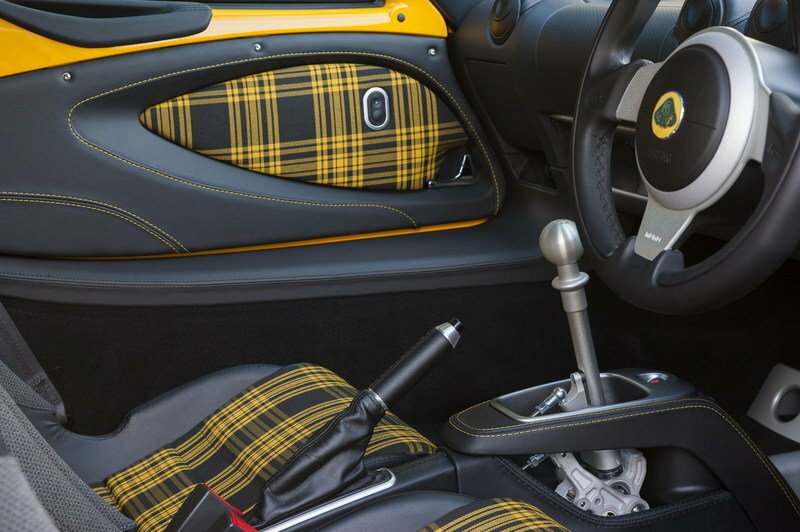 If you don’t fancy this pattern, Lotus will happily replace it with leather or Alcantara upholstery for an extra fee. Speaking of extras, the options list also includes air conditioning, an in-car entertainment system, full carpet and sound insulation. Another feature unique to the Sport 350 is the new gearshift mechanism that uses lightweight, machines and cast aluminum components. Making it that much more interesting is that mechanism is no longer hidden within the transmission tunnel, but exposed through an open-gate design. This not only reduces weight, but also enhances the cockpit’s race-inspired appearance. Not surprisingly, the Sport 350 gets its juice from the same supercharged, 3.5-liter V-6 engine found in all Exige models since 2012. In fact, the unit is identical to the Exige S’, meaning it cranks out the same 345 horsepower and 295 pound-feet of torque. Compared to the 360 Cup, it’s 10-horsepower less powerful. 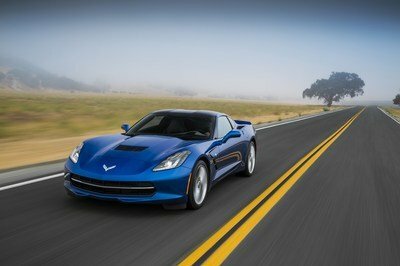 As a result of the weight loss, the Sport 360 needs only 3.7 seconds to hit 60 mph and 3.9 seconds to reach 62 mph. 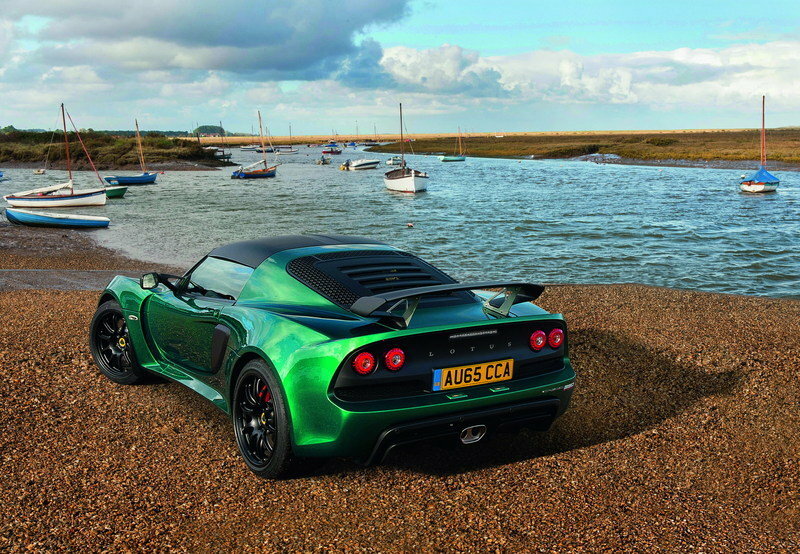 So how come it’s the quickest Exige yet, given it’s not the most powerful? 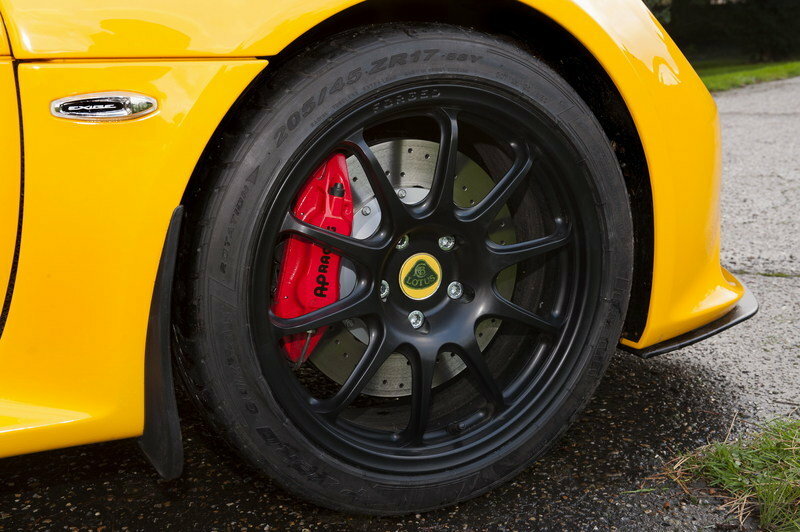 Well, it’s all about the curb weight, which sits at 1,125 kg, a 51-kg reduction compared to the Exige S. By selecting the optional lightweight wheels and cross-drilled brake discs, the weight drops further to 1,115, making it 61 kg lighter than the standard model and 15 gk lighter than the 360 Cup. The main features that contribute to this are the introduction of a louvered tailgate panel, a lighter battery, lightweight engine mounts, a lightweight center console featuring an exposed gearshift mechanism, lighter HVAC pipework, and the optimized use of sound insulation. As a result of the weight loss, the Sport 360 needs only 3.7 seconds to hit 60 mph and 3.9 seconds to reach 62 mph. 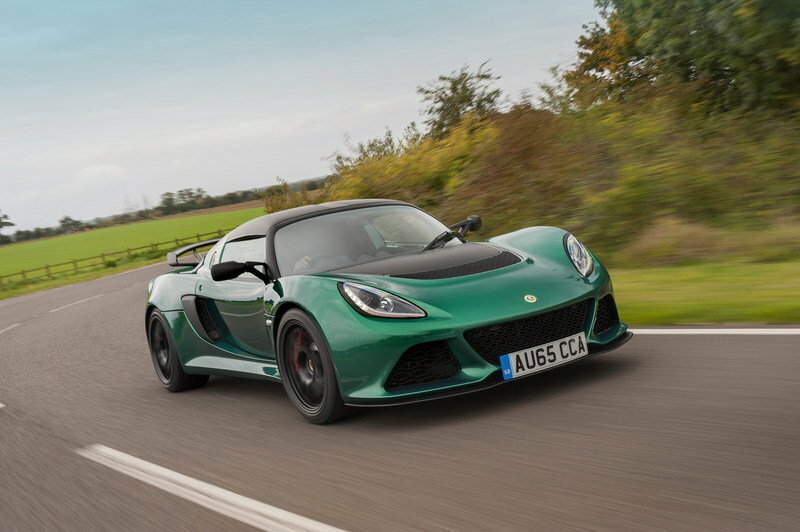 That’s a tenth-second improvement over the Exige S. These figures are available for models with the manual gearbox, which has been revised for more precise and quicker shifting. 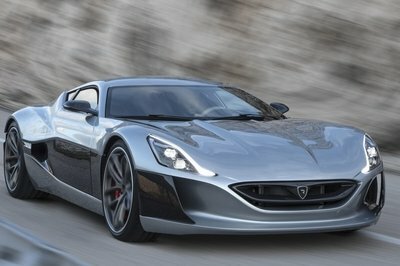 Automatic-equipped models sprint from 0 to 62 mph in 3.8 seconds, a tenth-second quicker than the manual version. Top speed remains locked at 170 mph, similar to the Exige S and Exige 360 Cup. Due to the aerodynamic kit that produces 42 kg of downforce at 100 mph, the firmer dampers, and revised suspension geometry, the Sport 350 is also quick on the race track. 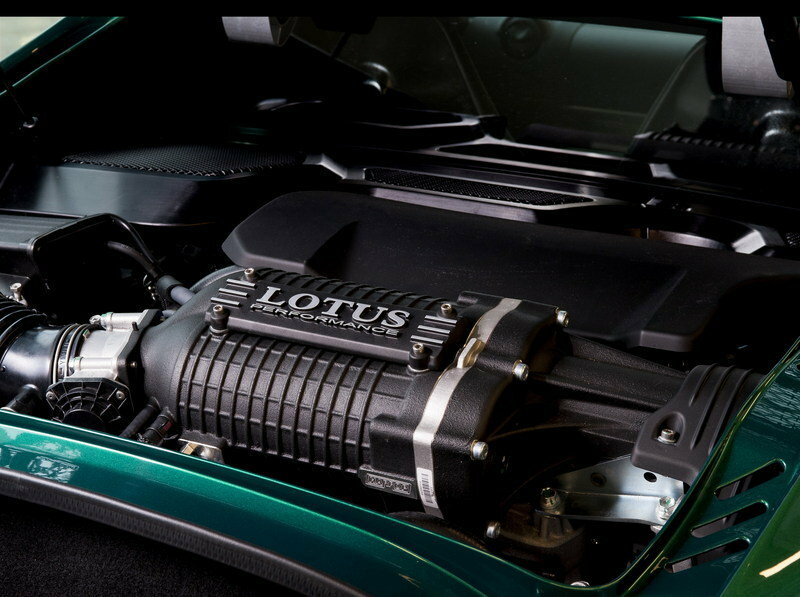 According to Lotus, the sports car lapped the Hethel test track in one minute and 29.8 seconds, becoming the first production model to lap the 2.2-mile circuit in less than a minute and a half. The benchmark shaves 2.5 seconds off the Exige S’ record. Quite impressive, but it would be a lot more interesting to see the Sport 350 lap the Nurburgring. 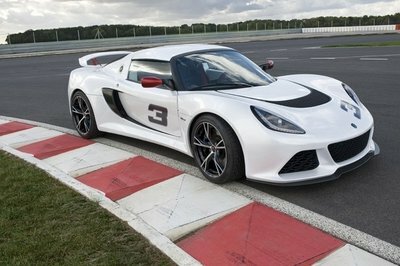 Pricing for the Exige Sport 350 starts from £55,900 in the U.K. and from €74,000 in Germany and other European markets. The British sticker makes it £7,095 less expensive than the Exige 360 Cup. Sales of the Sport 350 will commence starting February 2016 in Europe and from March 2016 in other markets, excluding North America. The GT4 is the latest and most extreme iteration of the Cayman. Its exterior stands out next to its siblings by way of larger air inlets and a massive rear wing, while the interior features sports seats upholstered in leather and Alcantara, and a sports steering wheel. For those looking to spend more time at the track, Porsche can install optional bucket seats made from carbon-fiber, and the Sport Chrono Package. Under the hood, the Cayman GT4 uses the 3.8-liter, flat-six engine of the 911 Carrera S. The mill cranks out 385 horsepower through a six-speed manual transmission and enables the car to hit 62 mph in 4.2 seconds, which makes it nearly a half-second slower than the Exige Sport 350. 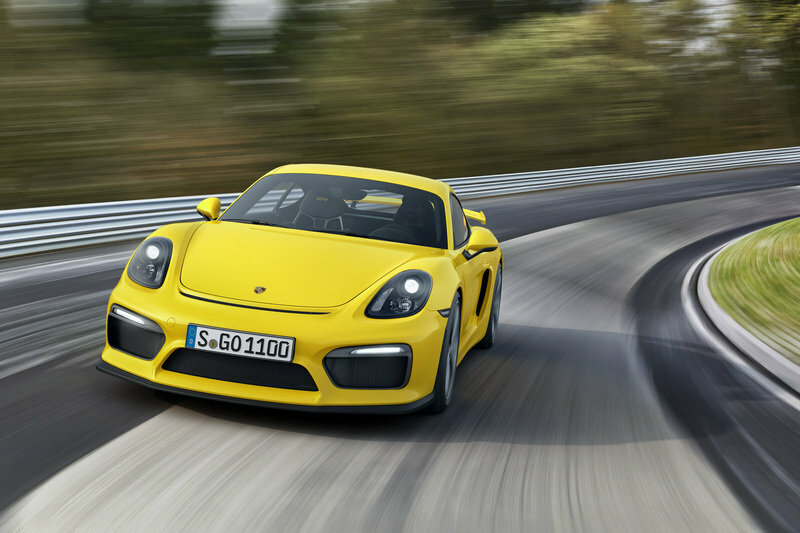 On the other hand, the GT4 is capable of significantly higher top speeds, as Porsche claims it can reach 183 mph. The Cayman GT4 starts from £64,451 in the U.K. Unlike the Exige, the GT4 is available Stateside. Despite being built on a older platform, the Exige remains one of the most exciting sports cars you can buy today, mostly thanks to the numerous improvements Lotus has made to the nameplate over the last two years. And while it might not have the fancy options you can get with the Cayman GT4, it’s significantly lighter and quicker than its German rival, which pretty much makes the Sport 350 the better track toy. If you’re in the market for a no-nonsense sports car that’s also capable as a race car, this Exige is your best option if you live in Mainland Europe or the U.K.